Only 2 minutes walk from the lovely estuary, this is a traditional family bach with all the basics for a great time away! A good sized and fully-fenced section, and your animals are welcome to a mini-break with you. 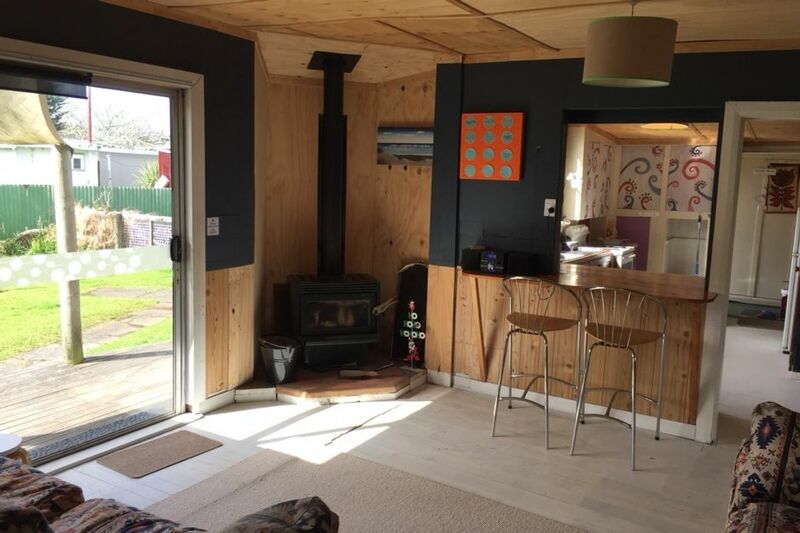 It's a real get-away-from-it-all Kiwi holiday - enjoy the peace with no TV or phone to interrupt your board games, swimming, walks and reading time. The bach is very family-friendly, with books, magazines, board games and toys all available to use. Playgrounds, Four Square, dairy and fish and chip shops are all in easy walking distance. This is also a wonderful spot for a couple wanting some time to reconnect with walks along the beach, a coffee at the local cafe and some serious downtime from the hustle and bustle of city life. The bach has space for 10 people - two sets of bunks (one with a double), a queen-size bed, one single beds and a fold out couch.The house is only 90sqm so while it can sleep that many, it's best for those who are happy with intimacy with their family and friends :) The room with the double and single bunks has a door, but the one off the queen bed and kitchen have curtains (keeping with that easy bach feel). This bach is a basic kiwi Bach that will take you back in time but please don't expect perfection! We'd hate for you to be disappointed. Cost wise, we are very extremely reasonable. By comparison, one night in a tent at the local campground costs $144 for 6 people and the local motel is $135 per night for 2 adults. There are more expensive baches at Foxton that may suit you if you are a more exacting personality. The house is so well equipped, we loved the atmosphere of the place and the fireplace heated the place so quickly we loved our stay and everyone said they would be back. Thank you! This little bach was well equipped for our family of four. We enjoyed our stay and recommend to others. This is a quirky and cute bach. It doesn't promise anything other than what it is. A traditional bach that is cosy, pleasant and relaxing. The owners are a pleasure to deal with and I would definitely stay here again. Property was nice and clean and well equipped. It was as advertised and we enjoyed the time without TV etc. Very restful, great for the dogs. Location was great and central for exploring other beaches.